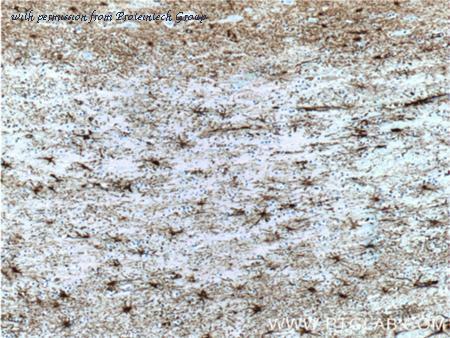 Formalin-fixed, paraffin-embedded human brain stained with GFAP antibody using peroxidase-conjugate and DAB chromogen. 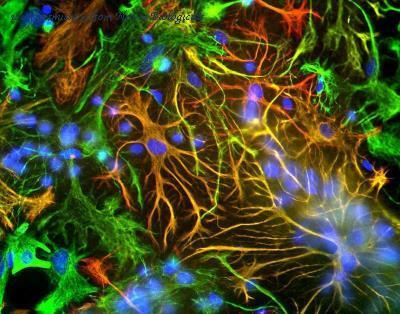 Note cytoplasmic staining of astrocytes. 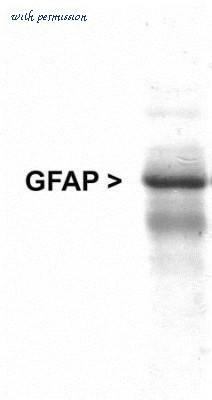 The GFAP antibody from Proteintech is a rabbit polyclonal antibody to a recombinant protein of human GFAP. 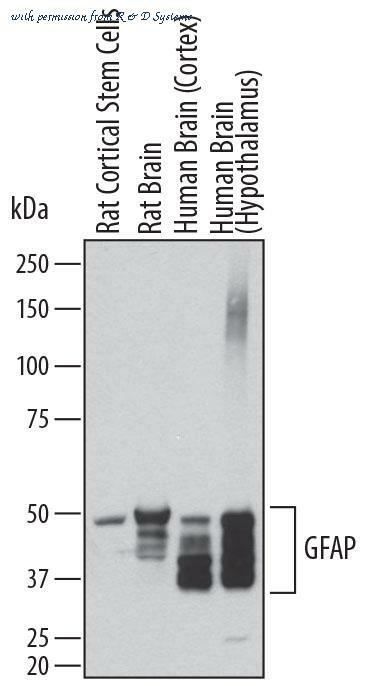 This antibody recognizes human,mouse,rat antigen. 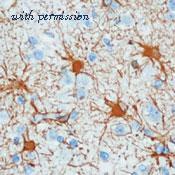 The GFAP antibody has been validated for the following applications: ELISA, WB, IHC, IF analysis. The GFAP antibody from Proteintech is a mouse monoclonal antibody to a recombinant protein of human GFAP. This antibody recognizes human, mouse, rat,pig antigen. 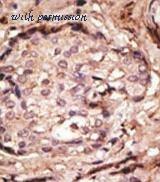 The GFAP antibody has been validated for the following applications: ELISA, IF, IHC, IP, WB analysis. The GFAP antibody from Proteintech is a rabbit polyclonal antibody to a fusion protein of human GFAP. This antibody recognizes human, mouse, rat antigen. 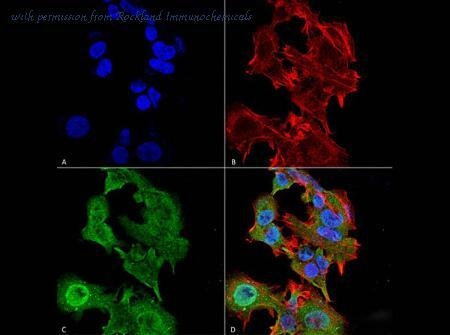 The GFAP antibody has been validated for the following applications: ELISA, WB, IHC, IP analysis. 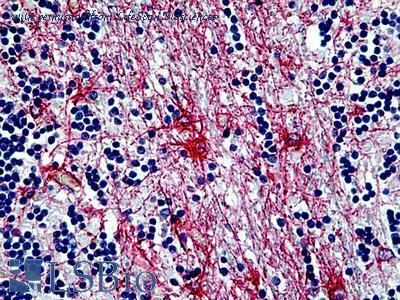 Immunocytochemistry/Immunofluorescence: GFAP Antibody [NB300-141] - Xenografted mouse brain section : astocyte and human nuclei. Image from a confirmed customer review. 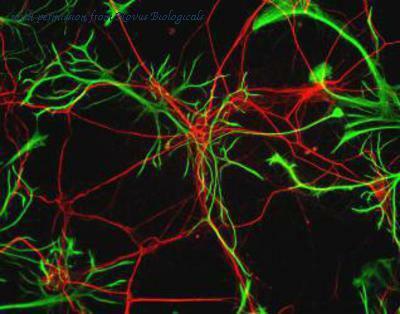 Immunocytochemistry/Immunofluorescence: GFAP Antibody [NB300-141] - Rat neurons stained with Neurofilament Heavy antibody NB300-217 (red) and GFAP antibody NB300-141 (green). Simple Western: GFAP Antibody [NB300-141] - Simple Western lane view shows a specific band for GFAP in 0.05 mg/ml of Human Brain lysate. This experiment was performed under reducing conditions using the 12-230 kDa separation system. 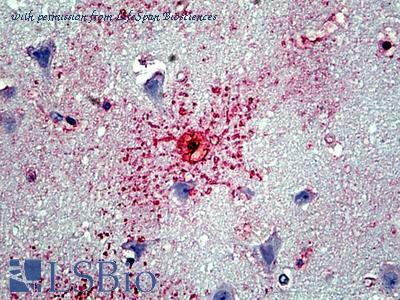 Simple Western: GFAP Antibody (5C10) [NBP1-05197] - Simple Western lane view shows a specific band for GFAP in 0.05 mg/ml of Human Brain lysate. This experiment was performed under reducing conditions using the 12-230 kDa separation system. Immunocytochemistry/Immunofluorescence: GFAP Antibody (5C10) [NBP1-05197] - Mixed neuron-glial cultures stained with NBP1-05197, and chicken polyclonal antibody to neurofilament NF-L NBP1-05219 (green). 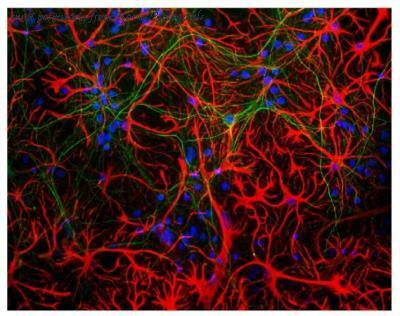 The GFAP antibody stains the network of astrocytes in these cultures, while the NF-L antibody stains neurons and their processes. The blue channel shows the localization of DNA. Immunocytochemistry/Immunofluorescence: GFAP Antibody [NBP1-05198] - Mixed cultures of neurons and glia stained with NBP1-05198 (red), and DNA (blue). 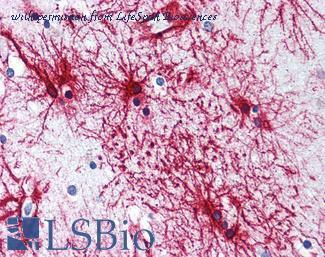 Astrocytes stain strongly and specifically in a clearly filamentous fashion with this antibody. Western Blot: GFAP Antibody [NBP1-05198] - Western blot of whole rat cerebellum homogenate stained with NBP1-05198. A prominent band running with an apparent SDS-PAGE molecular weight of ~50kDa corresponds to rodent GFAP. A lower band at ~45kDa is derived from the GFAP molecule. Detection of Human GFAP by Western Blot. Western blot shows lysates of human brain (motor cortex) tissue, human brain (cerebellum) tissue, and human brain (hypothalamus) tissue. PVDF membrane was probed with 1 ╡g/mL of Mouse Anti-Human GFAP Monoclonal Antibody (Catalog # MAB2594) followed by HRP-conjugated Anti-Mouse IgG Secondary Antibody (Catalog # HAF018 ). Specific bands were detected for GFAP at approximately 35-50 kDa (as indicated). This experiment was conducted under reducing conditions and using Immunoblot Buffer Group 1 . Detection of Human and Rat GFAP by Western Blot. Western blot shows lysates of rat cortical stem cells, rat brain tissue, human brain (cortex) tissue, and human brain (hypothalamus) tissue. 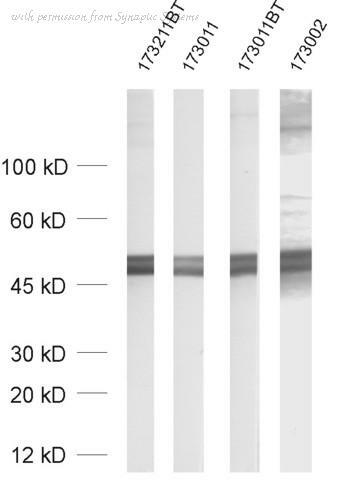 PVDF membrane was probed with 0.2 ╡g/mL of Sheep Anti-Human GFAP Antigen Affinity-purified Polyclonal Antibody (Catalog # AF2594) followed by HRP-conjugated Anti-Sheep IgG Secondary Antibody (Catalog # HAF016 ). Specific bands were detected for GFAP at approximately 35-50 kDa (as indicated). This experiment was conducted under reducing conditions and using Immunoblot Buffer Group 1 . 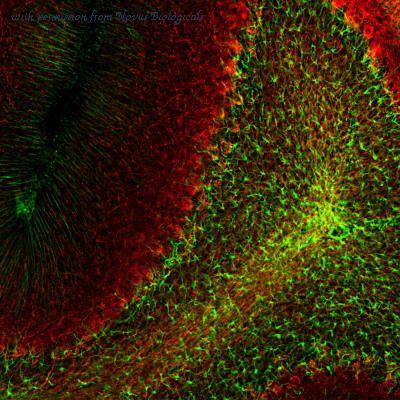 GFAP in Rat Cortical Stem Cells. GFAP was detected in immersion fixed differentiated rat cortical stem cells using Sheep Anti-Human GFAP Biotinylated Antigen Affinity-purified Polyclonal Antibody (Catalog # BAF2594) at 10 ╡g/mL for 3 hours at room temperature. Cells were stained using the NorthernLightsÖ 557-conjugated Streptavidin (yellow; Catalog # NL999 ) and counter-stained with DAPI (blue). 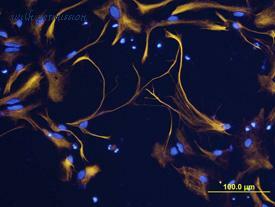 View our protocol for Fluorescent ICC Staining of Cells on Coverslips . Published customer image: . 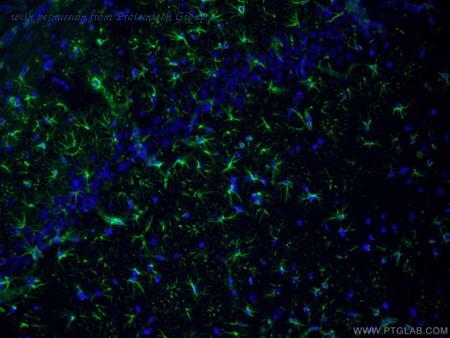 Rabbit anti Bovine GFAP antibody ( 4650-0204 ) use for the illustration of GFAP reactive cells in the rat accessory olfactory bulb by immunofluorescence. Image caption: . Triple label immunoreactivity in the accessory olfactory bulb. Sagittal section of the AOB (20 x) in a female rat showing immunoreactive cells for GFAP (green), NeuN (red) and BrdU (blue). From: Santoyo-Zedillo M, Portillo W, Paredes RG (2017). 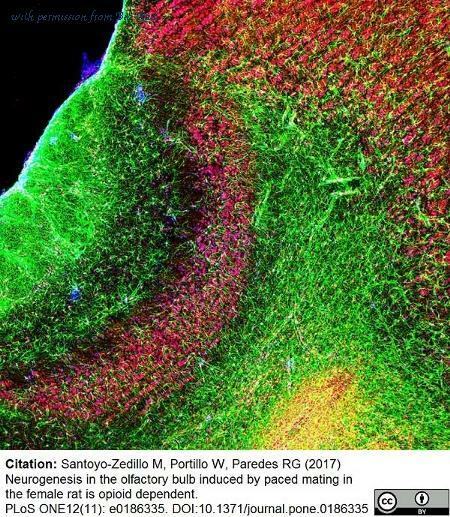 Neurogenesis in the olfactory bulb induced by paced mating in the female rat is opioid dependent. PLoS ONE12(11): e0186335 . 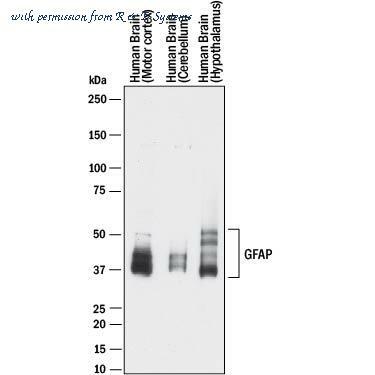 Western blotting analysis of human cerebellum (A), Mouse brain (B) and Rat brain (C) lysates (35µg protein in RIPA buffer) probed with Goat anti Human GFAP antibody ( AHP1468 ) at 0.01, 0.3 and 0.01ugml -1 respectively. Primary incubation was 1 hour. Signal was detected by chemiluminescence. 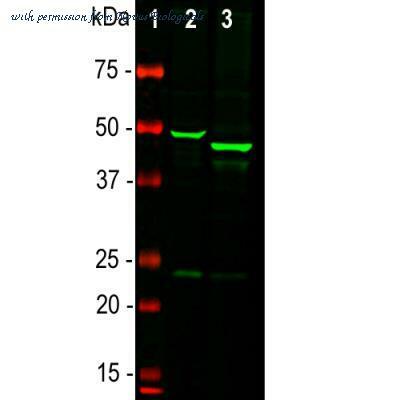 Western blot analysis of U251 cell Lysate, U87MG Cell Lysate using GFAP antibody. Flow cytometric analysis of Hela Cell using GFAP antibody. Western blot analysis of Mouse Cerebellum Lysate using GFAP antibody. Immunofluorescence of Mouse Anti-GFAP Monoclonal Antibody. 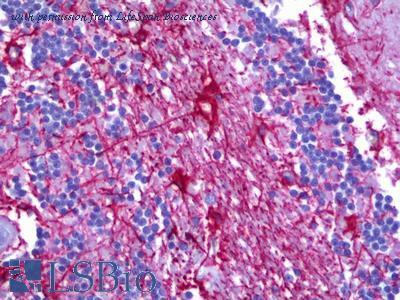 Tissue: Neuroblastoma cell line SK-N-BE. Species: Human. Fixation: 4% Formaldehyde for 15 min at RT. Primary Antibody: Mouse Anti-GFAP Monoclonal Antibody at 1:100 for 60 min at RT. 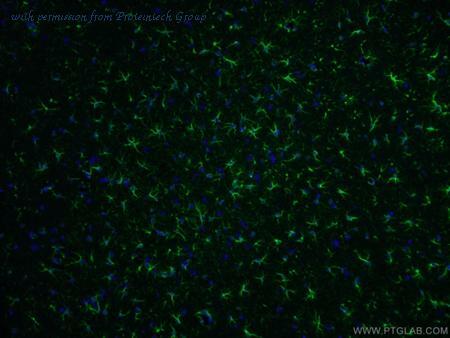 Secondary Antibody: Goat Anti-Mouse ATTO 488 at 1:100 for 60 min at RT. Counterstain: Phalloidin Texas Red F-Actin stain; DAPI (blue) nuclear stain at 1:1000, 1:5000 for 60min RT, 5min RT. Localization: Cytoplasm. Magnification: 60X. (A) DAPI (blue) nuclear stain (B) Phalloidin Texas Red F-Actin stain (C) GFAP Antibody (D) Composite.